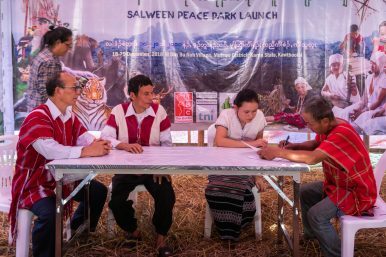 Representatives from Salween Peace Park Committee, Mutraw Disrict KNU and KWO sign a certificate declaring the establishment of the Salween Peace Park. In a separate article, I outlined the challenges facing those who seek to preserve Karen state’s pristine wilderness areas. For that article, I spoke with experts Saw Paul Sein Twa, the executive director of the Karen Environmental and Social Action Network (KESAN), and Robin Roth, Associate Professor in the Department of Geography, Environment and Geomatics at the University of Guelph. What are the challenges of doing biodiversity conservation in a militarized area, where local land rights are contested by the central government? Protecting biodiversity is a struggle on many fronts, with challenges including armed conflict, development projects, and extractive industries. Because the KNU (Karen National Union) has been able to assert its authority, Karen land has not been opened up for business on a large scale. We are able to assert our values, which include protecting biodiversity and indigenous culture. If we don’t have rights to our territory and land, we can’t do long-term conservation. It’s ironic that because of armed conflict natural resources and ecosystems have been preserved. All around Burma [Myanmar], government-controlled areas don’t have much biodiversity left. We’ve been telling our international counterparts that in terms of resources, we have the most in our territory. Key species such as tigers are only in ethnic territories. If the government wants to fulfill its international commitments to increase protected wildlife areas, they have to collaborate with indigenous peoples. They have to recognize our rights and our contributions. The more they persist with the current central government policy, the more armed conflict there will be. When did you have the idea for Karen Wildlife Protection Units (WPUs)? In 2013, KESAN had done limited wildlife surveys, but the area was very isolated, scientists had no clue what was in the forest. So we started working with the KFD [Karen Forest Department] to do further surveys, as well as getting support from outside conservationists. Surveys showed we had good numbers of biodiversity including key species, so our partners, including KWCI [the Karen Wildlife Conservation Initiative], suggested we needed to protect the rare species in our forests. Local indigenous communities can do much to protect biodiversity, but there are things they cannot do under the current circumstances, for example, with threats from armed poachers. That is why we agreed to set up the WPUs and trainings. But WPUs must work together with communities. Looking at the size of the forest and the terrain, without community support I think it won’t be effective protection and management. The WPUs are a way of empowering communities to set up their own management, by establishing community forests, demarcating village territories and ancestral domains, and trying to support them to renew and strengthen their local institutions, taboos, and traditional means of conservation. Now we are implementing conservation management software to improve our effectiveness. We are slowly building capacity. Karen Wildlife Protection Unit rangers are the front line in conservation enforcement and anti poaching efforts in Karen State. Photo by Adam Oswell/KWCI. Do local communities accept the WPUs? Yes, we train the rangers to work with the communities. 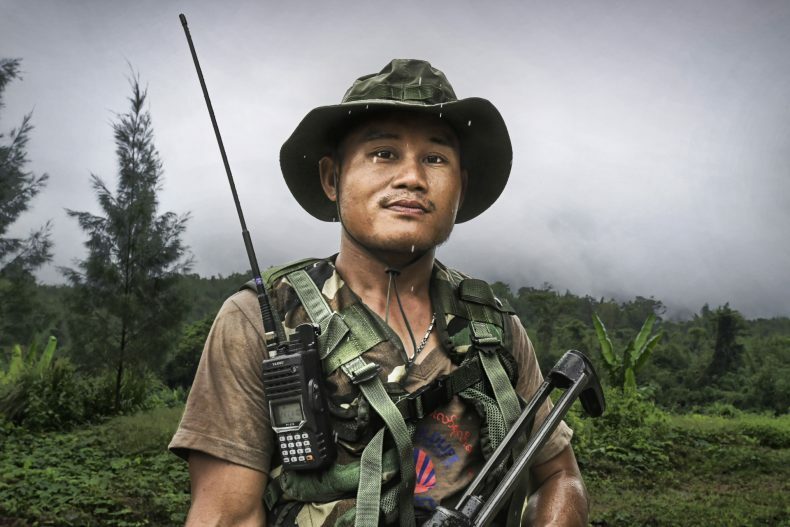 Some of the rangers are from the communities they are working to protect. Our WPUs have an indigenous mindset. With indigenous practices, if you say that the hornbill are prohibited for hunting, then wherever they fly, you cannot hunt them. It is not a matter of a demarcated boundary. In our traditional communities, we have a seasonal calendar, we look at things like trees flowering, to tell us the time to plow, time to plant…actually we working on preserving that old knowledge. Is this aspect of Karen culture being passed down? Yes, through songs, poems, and stories. For example, in the KESAN orchid documentary, they mention the names of orchids in songs, in reference to aspects of daily life. Names of animals, places, plants, trees, bamboos; they all are passed on in poems, songs, stories, myths, passing them on to new generations. Indigenous groups all have place-based stories. The Karen people have a strong voice. Has it been difficult to develop self-advocacy from a within a military government? We have learned how to do things step by step, and we got support from other regional and international activists. We have to look at the global context, because that drives what’s happening in our country. The military government is focused on extractive industries — oil, gas, dams. But after the ceasefire [in 2012], Karen territory was opened for other business, including infrastructure projects, SEZs, and green-grabbing. We look at what the UN and other countries are doing for indigenous rights, their legal frameworks, the UN Declaration on the Rights of Indigenous Peoples, then we look at the Myanmar government’s actions. We know of course the government will not recognize our rights, will not make any laws to protect us; they will always have laws that benefit them and their cronies. But they cannot do things without foreign investors and international community support, and multinational businesses have to respect human rights. This kind of framework is what we’re trying to promote, to make people aware what rights they have. During periods of intense conflict, it was very difficult to get donor support because of cross-border issues. What we have today is because we built the foundation in the early 2000s. Even today we are still lagging behind because we could have done more. But among ethnic armed groups the KNU is the best in terms of land and forest management, recognizing customary rights, so we are trying to lobby and do advocacy to say to the government: if you are doing peace-building, you need to address this, look at what KNU is doing. We are coming from a policy level, and at the same time from the ground-up, trying to influence policy development and policy reform. We don’t just do policy at the top, we also bring up people’s voices from below. Are you working with other ethnic groups in Myanmar? Yes, we work with many grassroots civil society organizations… since the early 2000s we have done projects together; we share the same concepts and approach. We shared our land and forest policies with other ethnic organizations, some of them adopted similar policies to ours. We have also worked with other ethnic groups to campaign against Salween dams. What about the recently amended vacant land law, which declares all virgin, fallow, and vacant land to be subject to confiscation by the central government? We are working with a national network to call for the revocation of the law… because it will create more war. The law gives the state ultimate authority to legally grab land from people. We say, there is no vacant, fallow, virgin land. That concept came from the British, but from an indigenous point of view, all lands have their own purpose, traditionally, socially, or spiritually… in the Salween Peace Park, some areas have no people but they are sacred lands, lands for spiritual dwelling. But they are also corridors for animals traveling through, they have a purpose. The animals also use the land. If you say it’s “vacant” you are so selfish… you are a human being, you see the forest as vacant wasteland, you need to convert it to agriculture or business or something, but what about ecology? You have to think of all those things together. Saw O Moo, a Karen community leader, was killed by Tatmadaw soldiers in April 2018. What kind of work was Saw O Moo doing? He was one of our best indigenous leaders—culturally, in terms of songs and poems…he was very active, organizing communities, working on the Salween Peace Park, boundary research, community forest management, patrolling the land…and he was also a farmer. The ceasefire was in 2012, but his family waited four years to see whether the situation was stable before coming back to their land from the IDP camps. In 2016, they came back to their land, then in 2018 he was killed. Has this happened before with community leaders? Yes, many times. Since 2012 we have lost four important community leaders due to military violence. Three were shot by the Myanmar military, including Saw O Moo, and one was killed by a mine. All four were killed in the Kershorter Forest, a community forest near the area where a Myanmar military road project is underway. That is why the Salween Peace Park is very important to help us act fast to document indigenous knowledge. We have collected the histories of engagement with the territory here… local history is important to prove that this land belongs to us, that our ancestors were here on this land. The Salween Peace Park reflects the core aspirations of the Karen people: Peace and self-determination, environmental integrity, and cultural survival. These three pillars of the Salween Peace Park are working well for our people. 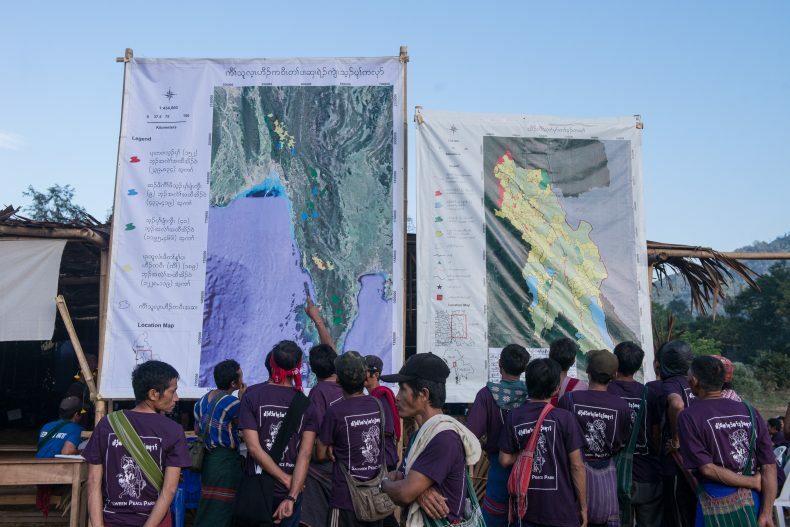 Participants in the Salween Peace Park Launch examine maps of the park. Photo courtesy of KESAN. What is the relationship between armed conflict and biodiversity preservation, in Karen State or globally? In places where there is long conflict inhibiting road-building and other infrastructure development, we frequently find high levels of biodiversity. Protracted conflict has ensured a low level of infrastructure development in Karen state, compared to what it would have been otherwise. This, coupled with Karen traditional governance, has meant that there are significant biodiversity values in Karen state worth conserving. How unique is the Salween Peace Park? The Salween Peace Park is quite unique in the region. The coalition that has established the park has been strategic in advancing its own vision of peace, development and conservation for the region without seeking permission of the central government of Myanmar. They have instead sought legitimacy and recognition from conservation actors and international networks advancing indigenous conservation. This first point is very similar to the Tribal Parks movement in British Columbia, Canada, where indigenous communities are seeking to establish a Tribal Park as a way of formalizing the ongoing management of their traditional territories. In both cases, the indigenous people are not asking permission from the country their territories exist within, but rather seek to make visible their traditional management practices so that others will accept that continued management will have positive conservation outcomes. There is increasing evidence that indigenous-managed parks are equally or more successful than state-managed ones in terms of conservation. Second, the Salween Peace Park is remarkable in the size of its territory and democratic processes of establishment within that territory. [Interviewer’s note: The Salween Peace Park is 5,485 square kilometers.] While tribal parks and indigenous protected areas in Canada have also gone through extensive consultation and a referendum, this most often occurs with a few thousand individuals. 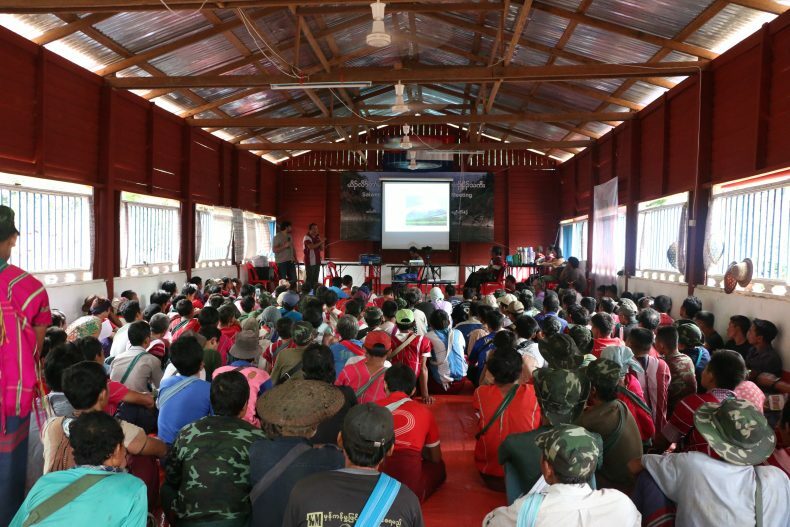 Salween Peace Park has had to consult over a large, difficult to access territory amongst tens of thousands of Karen. They used that consultation to create a Charter which received a 75 percent approval rate. That is remarkable. The process of establishment is well documented. It can be used as a template for other areas and can be adjusted according to local traditions and governance arrangements. Importantly, through consultation, the Charter recognizes the need for all stakeholders to be involved—the KNU, community organizations, and elected community members all have a role to play, with elected community members holding more seats than any other group. This last point is critical in a community-based, indigenous-led venture. Local community members participate in a consultation about the Salween Peace Park concept. Photo courtesy of KESAN. What would be the ideal outcomes for the project? What is necessary for the Salween Peace Park to succeed? The ideal outcomes would be continued and improved conservation of biodiversity, and the ability of Salween Peace Park governance to enact the kind of development they seek in the region. This would lead to greater stability, peace, and wellbeing of those living there. These outcomes can be accomplished through cultivating healthy relationships between the land and all its inhabitants — both human and non-human. Ideally, this can become a model for both conservation and development in populated agricultural areas where there is a desire to forge alternatives to conventional large-scale development, extraction, and infrastructure projects. Success will require continued support of the KNU. Ultimately, the Myanmar army and ruling party will need to respect the Salween Peace Park and its governance structure.